We serve as proud ambassadors for our clients, providing best-in-class heavy goods home delivery services that set your business apart. Heavy goods home delivery services. As national logistics experts specializing in last mile home delivery, we do the heavy lifting so you can provide the best home delivery experience for your customers and streamline your delivery operations. At Ovation, we understand that the brand experience extends beyond each sale. That’s why each delivery is supported by real-time customer feedback, with the goal of exceeding your customer’s expectations at every touch point. Our network of delivery partners and strategically located home delivery centers enable us to fulfill all your delivery commitments throughout Canada. Our clients are able to streamline and optimize their delivery operations thanks to our proven expertise and technology-driven processes. We offer simple, reliable and impactful heavy goods delivery solutions that make their mark. Our commitment to caring for the planet manifest​s​​​​​ through significant recycling ​initiatives, populating our fleet with idle zero-emission vehicles,​ and route optimization to minimize the distance between deliveries. 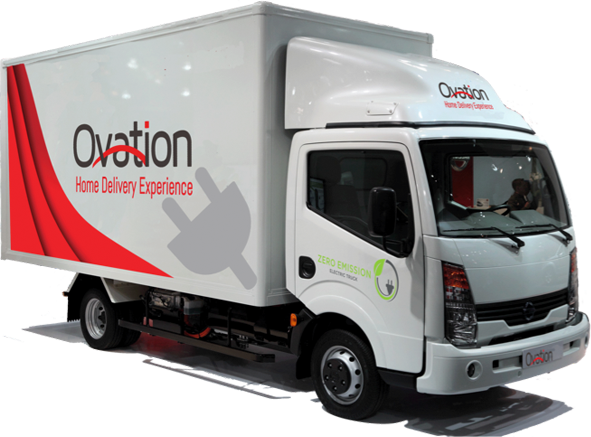 We also help our delivery partner​s​ switch to all-electric vehicle​s, ​thanks to an innovative acquisition program. Frigo Climat program partner for optimum old refrigerator recycling and halocarbons emission elimination.